Interior artwork featured in From Wolf to Woof! : The Story of Dogs by Hudson Talbott, Nancy Paulsen Books ©2016. 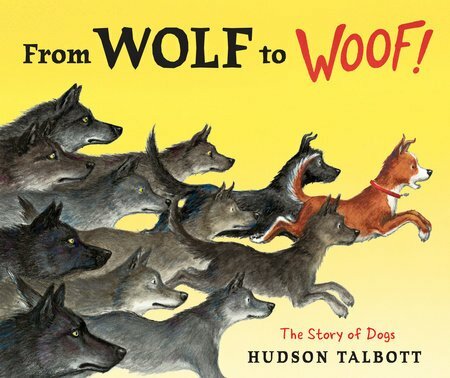 In this engaging story for children, Talbott writes and illustrates an imagined beginning where the first lone wolf puppy, cast out of his pack, soon befriends another loner: an orphan boy. The two build trust in one another and learn that, together, they survive better than alone. A particularly heartwarming image is when the boy first makes contact with the wolf, petting his snout. From there, everything changes. 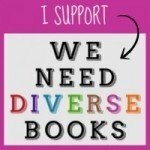 Thousands of years of evolution then changes humans from hunters and gatherers to herders and farmers. Previously wild wolves become domesticated dogs where they continue to adapt to our needs, developing specializations such as guarding, transporting, and, most important perhaps, comforting. Children will be thrilled that their beloved pet was once a wild wolf. It’s mind-boggling to consider that Chihuahuas, bulldogs, and sheepdogs originate from a similar ancestor. Talbott’s reimagining of the first contact between boy and wolf is a believable tale that offers an explanation as to how man’s best friend has evolved at our side throughout human civilization. The next time you listen to your dog’s howl, you will be transported back through time, back to when he was a wolf.